So I’m just going to put this out there – I love sparkling wine and Americans simply don’t drink enough of it. We have this idea that sparkling wine is fussy, expensive and only for celebration. None of those things need to be true. 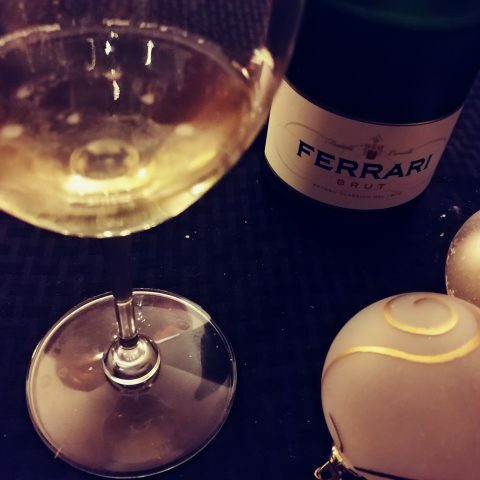 That’s why I was so excited not only to participate in this month’s #Winophiles exploration of Crémant wines, but also to host the chat on Twitter. One of my missions in life is to get people to realize that sparkling wine is great for every day drinking. Crémant is a great choice for a sparkling wine that you can open any time. It’s made in a variety of styles, it’s very well-available in the US and it’s a great quality-to-price option for a sparkling wine. It’s also a remarkable style of wine to pair with food. To celebrate Crémant, Dan and I planned a meal around several bottles (including a ringer, but I’ll get to that in a minute). The point of the meal was to explore Crémant with a variety of different types of food. It was also to give us a chance to revisit our memories from our trip this summer. If you were following us in August, you saw the pictures from our visit to Nantes in the Loire region of France, which included a fantastic day trip to Saumur, the home of Crémant de Loire. While we were there, we were lucky to taste at a few fantastic places and even though we were seriously-fingers-crossed-pinky-swear NOT going to haul home sparkling wine bottles in our suitcase, we … brought home about 6 bottles (and some still wine, too…). Sunday dinner this week gave us a chance to open two of them, plus a bottle of Crémant du Jura that we’d tasted recently at a local wine tasting. We started with two bottles, the first from the Loire, the Bouvet-Ladubay Saumur Zero Extra Brut and then the Benedicte & Stephane Tissot Crémant du Jura BBF 2005-2006 in our glasses. 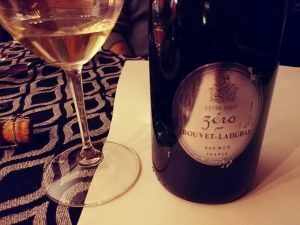 The Bouvet-Ladubay is a blend of Chenin Blanc and Chardonnay. It shows as clear pale lemon in the glass. It is, as the zero dosage would indicate, exceptionally dry with a very fine mousse. It is medium alcohol with bright, crisp high acidity. The nose has notes of citrus peel, brioche, lemon curd, lime pie, ginger, apple and pear which follow through on the palate, especially the lemon curd, brioche and ginger. This is a clean, crisp wine that has potential for aging. The BBF is quite different. It’s a 100% Chardonnay wine with a very long time – at least 48 months! – on the lees. It’s also a zero-dosage wine, so it presents as very dry but the extended tirage gives it plenty of lovely almond, sherry, lemon and custard notes. 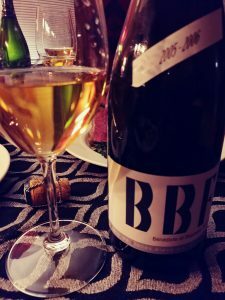 This wine is a blend of the 2005 and 2006 vintages and it very much shows the varietal characters of a Jura Chardonnay, particularly with the sherry/nutty character. Very long finish with extremely fine bubbles and an expressive, round feeling in the mouth. For our appetizer, I did two seafood dishes. First traditional Thai fish cakes with sweet and spicy dipping sauces and a cucumber salad accompaniment. Second, we butter poached freshwater prawns. Both of the Crémant wines paired very, very well with both the lighter fish cakes and the very robust butter prawns. 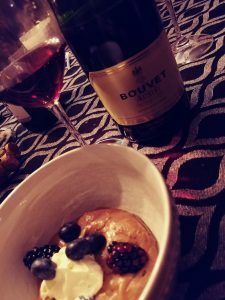 One note – the pepper that I picked up for the salad was on the hotter side and that did pull the wines, especially the Bouvet-Ladubay a little out of sorts. I usually test my peppers for heat and add accordingly but there’s such a little bit in the cucumbers that I didn’t this time and I was sorry. The main was a reverse-seared tri-tip roast, potatoes dauphinois and sautéed spinach. The wines really paired well with this course and it demonstrates some of the versatility of Crémant. People are hesitant to pair sparkling wines with steak, but I promise you, a good quality sparkler that is well-constructed will mesh nicely with red meat. The tri-tip roast had a thick fat cap on it, and the rich meat and crispy fat work so well with the effervescence of Crémant wines. Since both were zero dosage, they both presented with very refreshing acid. 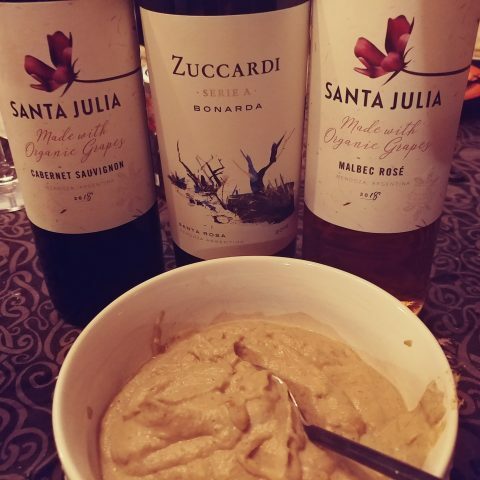 Although the meal, especially with the potatoes dauphinoise, was quite heavy, the wines balanced out the fatty, creamy flavor and helped prepare the mouth for the next bite. For dessert, we went with a ringer – a vin Mousseaux that we bought when we were visiting Bouvait-Ladubay in Saumur. It’s similar to a Crémant, except that it’s red and fermented in stainless rather than in oak. The Bouvait-Ladubay Rubis Excellence Demi Sec is 100% Cabernet Franc and shows as clear, medium ruby with rose-pink foam and small bubbles. Very intense nose of crushed strawberries, raspberries, brioche, roses and cream. The palate has zingy strawberry, hints of sweet red cherry, brioche and cream. It’s got a long finish that shows the fruit and slight sweetness which is balanced nicely by clean and crisp acidity and low soft tannin. This is a really fun wine that went nicely with dark chocolate mousse and fresh berries. I wouldn’t pair this with a very sweet dessert because it’s not a very sweet wine, but it does have a good level of sweetness to match with fresh fruit, custard, cheeses or very dark chocolate. This recipe is surprisingly easy. You can use a food processor to make the fish paste or use store-bought, but I prefer to do it by hand the traditional way because you get a better texture from the fishcakes than if you use a mechanical chopper. Tear the fish into large chunks and mash it with your hands against the side of the bowl. You want to do this until the fish is completely pulped. It will take about 5 minutes of working the fish through your fingers and against the side of the bowl. Just squeeze until the fish flakes, falls apart and starts to bind. It’s messy and if you’d rather not, using fish paste or using a mixer will work. Add the two tablespoons of curry paste, the scallions (long beans are traditional, but I prefer the little tang of the scallions) and the egg and blend like you’re making meatballs. You don’t need any additional binder, the proteins in the egg and fish will hold together just fine. Once the mixture is completely blended, form into patties and refrigerate while the oil heats. 1 hot chili pepper diced – use to taste! Mix all liquid ingredients in a bowl until the sugar dissolves. Cut cucumber and scallion and finely mince the chili pepper. Taste the chili for heat and use to taste. Add vegetables to dressing and chill at least 30 minutes or up to 1 day. Serve garnished with crushed or chopped peanuts. Put the butter in a pot to melt over very low heat. Add the wine, garlic, shallots and herbs and allow to warm and infuse for 5 minutes. Add the prawns whole and allow to poach slowly in the warm liquid. Depending on the thickness of the prawns, it could take up to 20 or so minutes to fully poach – do not let liquid come to boil or sautee temperature. This is slow cooking! To serve, put some of the sauce on a warm plate, place bread or toasted bread slices on the plate, top each piece of bread with a prawn and drizzle some of the poaching liquid over each. Serve immediately with extra bread for dipping in the sauce. Preheat oven to 375. Slice potatoes thin (you can use a mandoline if you have one, or just slice thinly with a knife) and put in a pot of salted water to parboil. You don’t want them to cook to the point where they’re falling apart, but you do want them to soften. While the potatoes parboil, put the cream, half and half or milk, shallots, butter and persillade on low heat to simmer so that the cream absorbs the flavor of the shallots and herbs and the butter melts. Do not boil. Test the potatoes for softness. Put a spoon or two of the starch foam from the potatoes into the cream mixture to help it thicken. When potatoes are just starting to soften, drain and transfer to a buttered casserole dish. Pour warm cream mixture over potatoes. Add extra cream of milk if the potatoes aren’t just completely covered by the milk mixture. Top with grated cheese. Bake until the potatoes absorb most of the cream mixture and the cheese browns. Serve immediately. The BBF was awesome. We still have another bottle reclining in the cellar. I love sparkling wine with steak, especially a very fatty cut like the one we did. Sparkling wine and fat are really good friends. I pull out potato chips with nice sparklers all the time because people think I’m kidding. It also helps break down the wine snob sterotype, too. Wow….that was quite the feast. Thanks for all the wonderful recipes and pairing ideas. Thanks for hosting too Kat….I was not familiar with these wines and am excited to try more of them. Thanks for hosting! And I’m looking forward to trying out your recipe for potatoes dauphinois — I can see how good these would be with sparkling wine — or with ham for the holidays! You had me at Butter Poached Prawns! I will admit that I am fascinated by the vin Mousseaux. I am a sucker for sparkling reds…well I’m a sucker for bubbles of any sort, but when I get variety in bubbles, that makes me really happy. And as a lover of Cab Franc…this wine sounds right up my alley. 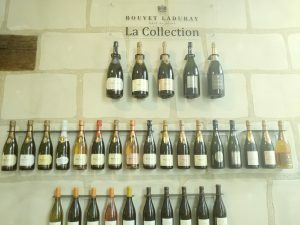 Of course I suppose I will need to venture to Bouvait-Ladubay in Saumur to find a bottle…guess I should start planning. Thank you for hosting! I so agree, sparkling wines should not be kept for just celebrations and holidays. Your pairings sound delicious and the Crémants intriguing. I have not tried a Crémant from the Loire or Jura, you have peaked my curiosity. I really like wines from the Jura. It’s also a region that I’ve passed through on the train several times but haven’t gotten a chance to visit yet. It’s definitely next on the list. Kat, you really pulled out all the stops for this meal! I love Thai fish cakes but haven’t found a recipe I like, so will give yours a try. And you tasted a Cab Franc – I found one that I love (La Cravantine) and will gladly drink it any time. Thanks again for stepping up to host this month; you did a fantastic job! Cooking is one of the ways that Dan and I create time together in an otherwise way to busy life. I love being part of these events because they give us a chance to think about some different things and stretch a little. Next month’s French-Style Season event is going to be awesome. 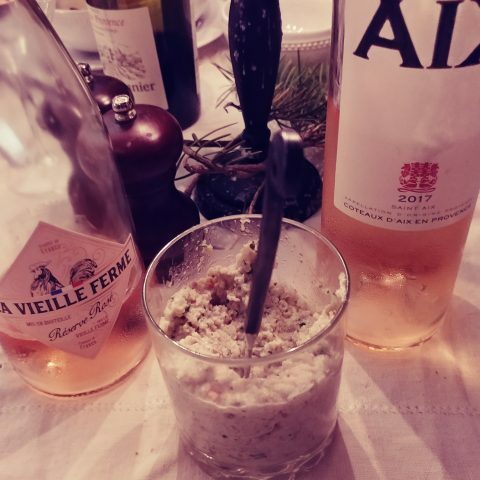 Christmas in Provence and the traditional meal. Sadly not making it to France for the holidays this year, but planning the meal and assembling the ingredients is calling up so many pleasant memories! Beautiful wines! I wholeheartedly agree that we should be drinking sparkling wine more as part of the every day table. Thanks for creating another opportunity in this month’s topic! I drink a ton of sparkling wine. I’m working on an Italian sparkler post for this month. I love that if you’re willing to go off the beaten path, there are so many sparklers that are fantastic and not budget-busters.